Looking for a creative way to announce the gender of your baby to family and friends? 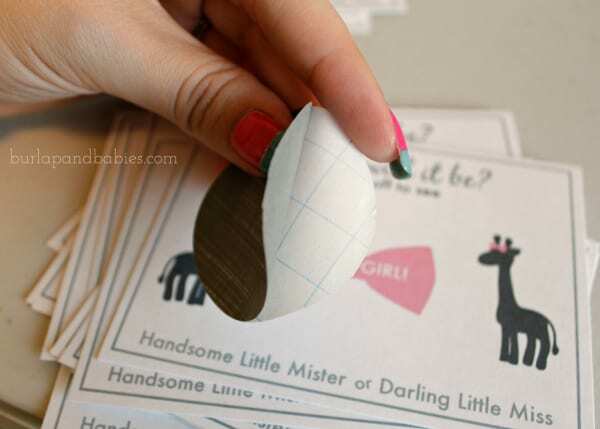 Make these easy gender reveal scratch off. FREE printable included. As promised, today I am sharing with you how I made our very own gender reveal scratch off to reveal the gender of our baby to our closest family and friends at our gender reveal party. I had seen many DIY scratch-its floating around Pinterest, especially around Valentines day or as an anniversary present, but didn’t see any to reveal the gender. So I decided to just wing it and ended up loving how they turned out! And time! This isn’t an easy project to start last minute. First, you need to make up what you want scratched and print them. Make sure that whatever size you make them fits with what size of actual scratch-it piece you’ll make. For example, I had a 2 inch circle punch so I needed to make sure the scratch-it was big enough so that the pink bow was covered. I designed my scratch-it in Illustrator, but you could just as easily do it in Microsoft Word. And because I love you all so much….I included a free gender reveal printable at the bottom of this post just for my readers! Next, you need to mix two parts paint to one part liquid dish soap. Don’t get too worried about having the exact right proportions. It’s a very flexible guideline. I did about 2 tablespoons paint to 1 tablespoon dish soap. Between coats I covered the mixture with saran wrap and put it in the fridge. Spread out your clear contact paper on a flat surface and start painting. Depending on what color paint you use, you will most likely have to do 3-5 coats of paint in order to get a thick coat so you can’t see the content below the scratch-it. Don’t worry though! That’s normal. The soap makes the paint pretty streaky so you’ll need multiple coats. 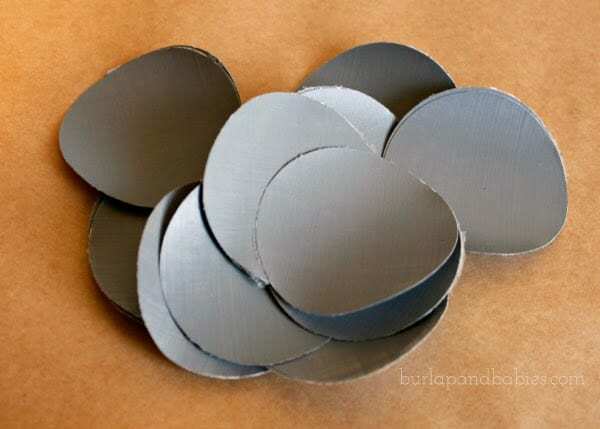 Once you’re happy with the paint density and it has time to completely dry (at least an hour after the last coat), then you can start cutting out your circles (or whatever shape you’ve chosen). I used a two inch circle scrapbooking punch and it worked great! Then all you need to do is peel off the back part of the contact paper and stick it to your scratch-it and wait until the big reveal! For us, we didn’t tell anyone we had made scratch-its and everyone thought that we were still planning on revealing the gender through the cake. Little did they know we didn’t trust people to not stick their finger in the cake so we went to plan B and I think it turned out perfect with a little element of surprise! Are you planning a gender reveal party for either yourself or a friend? 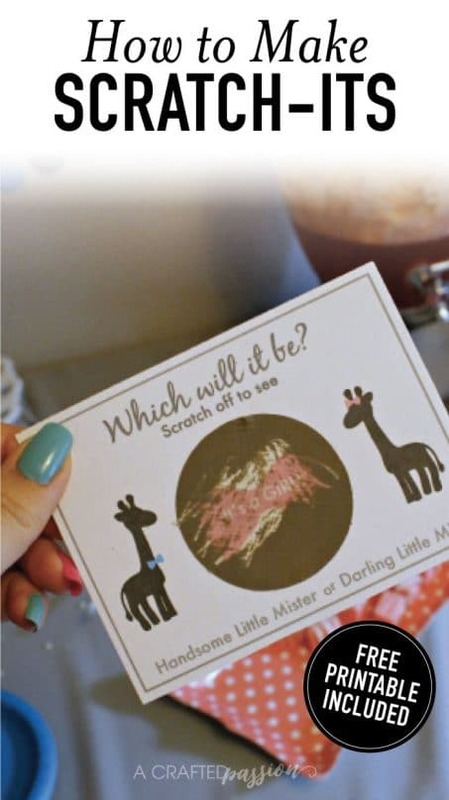 Want to create a gender reveal scratch off? I’ve included a free gender reveal printable just for you! 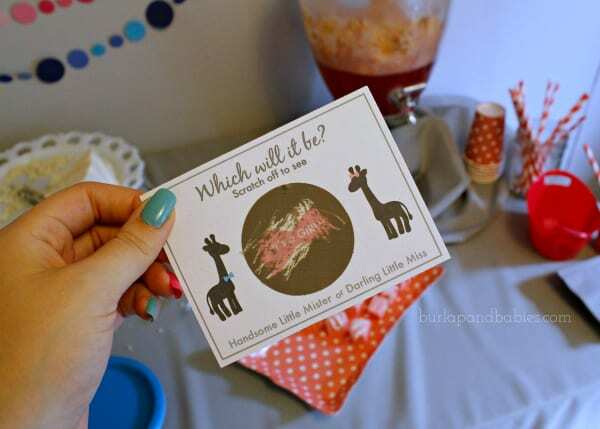 If you missed the full gender reveal party post, you can catch up and read all about it here. Can’t wait to try this. Thanks so much for sharing. I’m not familiar with scratch-it paper. I’m not seeing in the directions where it says to use the scratch-it paper. Ar we supposed to print the template right onto the scratch it paper? Hi Priscilla. The scratch it part is made using the contact paper and paint mixture. You then stick this onto your cards that you’ve printed off. Let me know if you have any other questions. I am having issues with my paint/dish soap mixture not drying. I put on the second coat about an hour after the first, even though the first wasn’t completely dry. It’s been sitting for almost three hours and is still completely wet. Any suggestions? Oh no! What kind of soap did you use? And what ratio did you use? Could you give us the measuring amount you used for the paint and liquid dish soap? I think that would help alot. Hi Rebecca! I have updated the post with this info. I did about 2 tablespoons acrylic paint and 1 tablespoon dish soap. Hope that helps! Cute! I made one similar for our gender reveal last year. I make scratchers all the time for my husband. I’ll have to try the contact paper (I usually print my scratcher then cut tape over the part that I want scratched, and then put the paint over the tape). Your idea seems much easier. I HAVE SEARCHED HIGH AND LOW FOR SOME CLEAR CONTACT PAPER WITH NO LUCK. ANY SUGGESTIONS ON WHAT WE COULD USE TO MAKE THESE? THANK YOU! Have you tried the dollar store? That’s where I always find it. Or Amazon carries it (http://amzn.to/29SJoq2). If that doesn’t work, you should be able to use clear packing tape. Hi. Thanks for sharing this fab idea! I live in India..Is contact paper, sticker paper? Thank you very much for the wonderful idea. I will defiantly try it for our baby announcement. I love this tutorial! Where did you find your animals and bow? What a clever idea for oh so many things. Thanks. Thanks for sharing! What app or software did you use to create the card? I had a hard time cutting out the circles with a punch cutter. Is there a specific brand of cutter you used that was sharper or…. ?